Another Wednesday and not much random for you guys. Sorry that I have kind of fallen off the wagon for this link up. Really and truly life has been pretty un-random. It has actually been quite monotonous. Not that's that a bad thing...just chugging along being a mom, wife, helping with homework, wishing I had a live-in housekeeper, selling Girl Scout cookies, blog work fun, answering emails, gearing up for busy weekends, washing clothes, paying bills, wishing said bills would take the high road, counting down the days until Gus gets home and planning birthday parties. You know, the normal every day stuff. This is actually where I like things...calm, cool and collect. No unexpected interruptions or situations that throw us off our route. Just like everyone else, I am ready for spring and over the warm one day, freezing the next day weather. I know I sound like a broken record lately. Anyway, I came across this Forever 21 floral maxi dress and immediately added it to my cart along with a handful of other items. I had gift cards from Christmas burning a hole in my pocket. I couldn't wait to wear it, so despite the cool and windy weather we had yesterday, I slipped it on and added a cropped jacket to cover my back and shoulders. I think this dress might make another appearance before the heat wave hits. I am picturing it layered under a sweater to give the illusion of a skirt. Even though this is a bold, floral print that makes a lasting impression, I see myself getting plenty of wear out of it. I am positive it will be on constant rotation for lunch, shopping, outdoor events and last minute errand running. It's super comfortable and I am obsessed with the back. I am wearing a medium. It fits like a glove and glad I didn't end up going with the small. It's also fully lined and not see through at all. Other items on constant rotation are two pieces from Sweet Clover Jewelry. I am pretty sure that you have seen this bracelet about 10 times either on my blog or Instagram. It's one of those pieces that goes with everything and adds the perfect amount of party to your wrist. You have also seen this necklace before when I layered it with another piece and again today. Shelli with Sweet Clover Jewelry and I have been friends for over a year now. Her Etsy shop is filled with some of the cutest and most affordable items that I have come across. She just added lots of adorableness to her shop. It's the perfect place to find Valentine's Day accessories, jewelry for bridesmaids, birthday presents or Mother's Day gifts. Today Sweet Clover Jewelry is offering you the chance to win a $30 shop credit. You can also get 20% off your order when you use the code SHANNA20. I have several of her pieces and love every single one. I know you will too! I am so glad that you mentioned that Etsy shop! I can never get enough of Etsy. Love that you used that jacket in one of your posts because I have a similar one! Great Etsy to feature - I love her products! And sometimes routine is good, I'm actually wishing I had some more structure in my life right now. Being too free isn't always the best. Loving this floral look too! The bomber jacket makes it perfect! Nothing wrong with going through a cycle - as long as it's a good one! I love the dress and florals and the thought of it being warm again. And also, I'm so bummed that I'm missing out on GS cookie season - my Samoasssssss!!! Fashion cycles are good. I think I am having one as well. All I want to do is print-mix and wear bright colors lately. Check out today's outfit for example. Your maxi dress is gorgeous as are your booties. Perfect styling for winter. 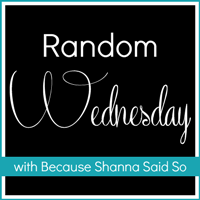 Have a Great Wednesday Shanna!! Oh that dress is a must have I was so sad when I saw it was not available in my size. Now I must go to a local store, you look gorgeous lady. Great way to wear florals in winter...sounds like it was a great buy from f21! That jacket is the perfect shade for the dress. I love this. You look gorgeous! Ooh! It's so tempting to buy that dress ... and about 50 other things on Forever21's website!! It really is nice to have life kinda calm and monotonous for a while! It helps you catch your breath (and catch up on life!) Ok this dress....I just might have to get it. My first time linking up here. Such a pretty dress. I love the way you styled it! 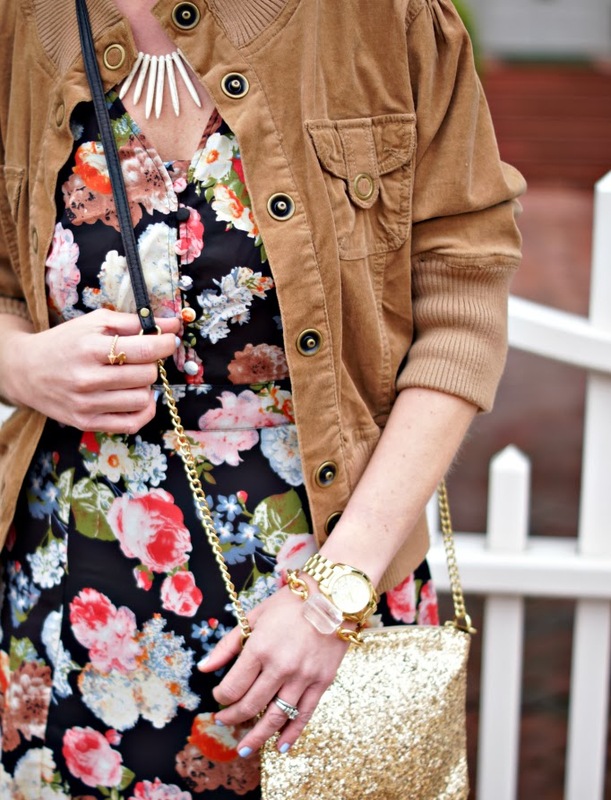 Seeing this pretty floral dress on you makes me long for spring even more - love it! I can't wait for it to warm up and stay that way! I have a few new maxi's from F21 and Target that are waiting for their debut! I like how you layered this one and added the heels. Oh and love your glitter crossbody! This floral print is just making me wish Spring would come sooner already! ;) I love it with the jacket and booties! Oh yes, this outfit makes me soooooo excited for Spring! I love your floral maxi dress! Most of the time....being at status quo is the best because that means less stress and pressure. And that means your family and lifestyle is at its best. You just made me look forward to Spring again with this pretty floral....I tried going the maxi route last weekend but it left me with cracking knees due to the cold haha! That dress is fantastic! Do you shop a lot at Forever 21? I never really have since I assumed it was "junior sizes" which don't fit me that well. I have no idea where that assumption came from, but I sure see their products around a lot...guess I'll have to stop in there & check it out. Thanks for the spring inspiration! First of all, yay for a maxi in winter time! Love it. Second, I love, love, love the purse. Sparkles all the way. Happy Wednesday! SAD TIMES! There's only large left! DANG IT! Love, love .... LOVE this whole look! That maxi is so pretty! You look beautiful, as always! I love the print on the dress–the perfect dark floral for winter! 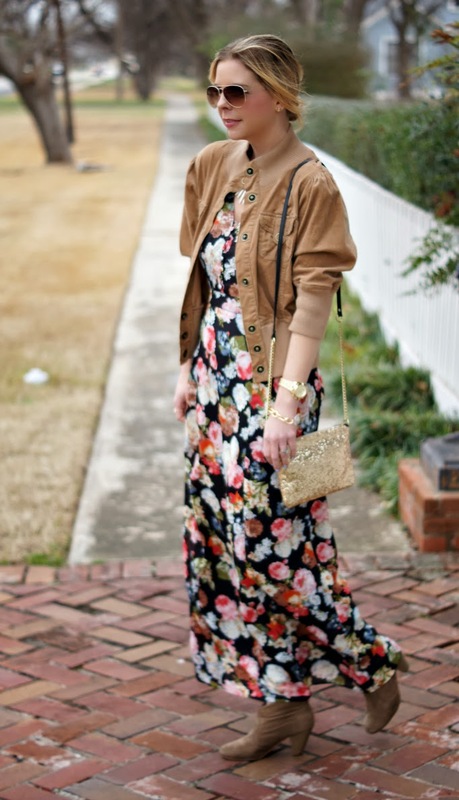 That pretty floral maxi is making me wish it was warmer here! And I love Sweet Clover...I have 2 bracelets from the shop and I'd love another! We mama's are so amazing!! I am SO ready for spring. Love this dress on you, so pretty! And the jacket looks perfect with it. I definitely see you getting lots of use out of this dress for sure! Great maxi dress and how you wore warmer pieces with it. I have always worn them in the summer but never in the winter...need to give it a try. Great pieces on Sweet Clover! Thank you for introducing me to it! I feel the same way- a bit monotonous but that's a good thing sometimes. I'll take it right now. As Rachel Zoe would say 'I die!!" So gorgeous Shanna! I am so craving for Spring now! Hope you are having a wonderful day! Such a gorgeous dress..and I love your sparkly bag! sometimes monotony is the best really. But that outfit is anything but! i love all the pieces!! Shut up - this dress is amazing!!!! And I love the way you styled it!! Thank you so much for all the love, I ADORE seeing your pictures every day, and seeing my jewelry on you just ices the cake! xoxo loves!! You look adorable, as always!! We love your look, flowers come back because we are looking forward the spring and gold touches are perfect! Shanna! This dress is everything! It looks fantastic on you! 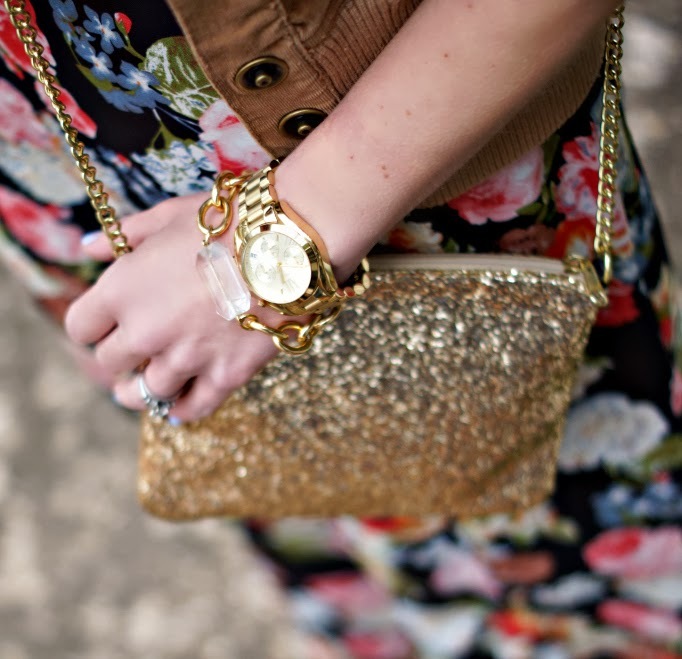 Very pretty dress, love it paired with the sparkly bag! You look so cute! Really hard to choose just one fave...I do love the BlueTeardrop Statement Necklace - Royal Blue Turquoise Layered Necklace! That floral dress is gorgeous! Looks like forever 21 has some good options right now! I'm pretty excited to shop for Spring even if the weather won't cooperate for months... haha I've already bought a new bikini despite having way too many already. Life around here has been pretty mundane too but I can't complain. sometimes it really is relaxing. I am in love with this dress! You are absolutely stunning as always my friend! I love the florals! Makes the drab of winter a little more fun! What a great shop! I really like the Turquoise Teardrop Statement Necklace. In love with this look! Wish the weather would break here for something like this! Love the floral maxi! I really like the top with the buttons. It looks great with the leather jacket too. And that sequin purse is so fun! I feel like I haven't had anything really interesting going on lately. Just normal, boring stuff! That floral maxi is too cute! I love florals in the winter because it is unexpected. And that sparkly bag needs to come live at my house. That dress is wonderful! Thank you for introducing me to Sweet Clover because I am so in love. Her prices can't be beat and her style is perfection! How many more days until Gus comes home?!? Love this look--so eclectic! Aww I can't imagine my puppies being away that long--can't be easy, but I am sure you'll be so happy when he gets back! I love this dress, and it is so refreshing to see a floral print maxi right now, especially after all the snow we just had up here! You are beautiful! What a lovely dress Shanna! !